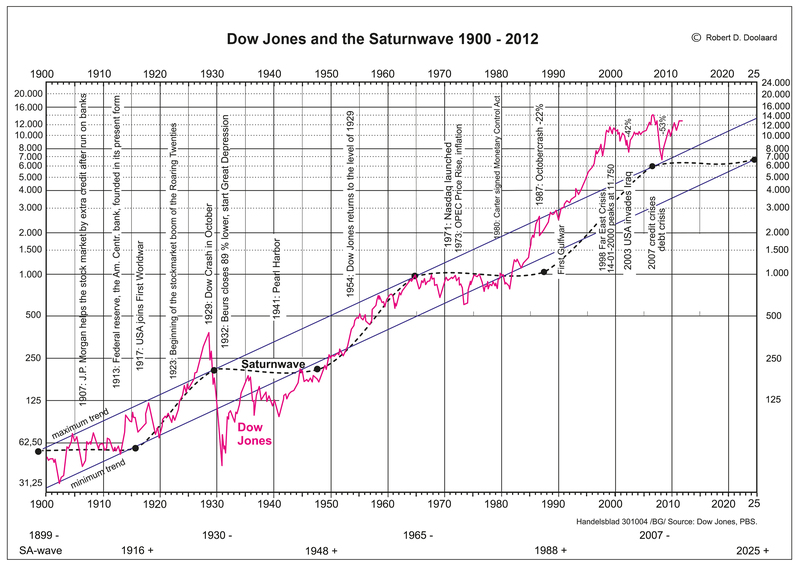 The correlation between the long-term trend of the Dow Jones and the Saturn wave is striking. When the wave is descending the Dow remains stagnate, despite dramatic fluctuations; when the wave mounts, so does the stock market. The above graph of the Dow Jones is not linear but logarithmically structured. On the y-axis each duplication is equal, providing a clearer overview of the changes in the stock market in terms of percentage. In a linear formation the spectacular increase in the rates in the 1920’s would shrink into insignificance in comparison to that of the 1990’s. To give a clear indication of the relationship between the Saturn wave and the Dow Jones, I have projected the wave peaks on to the line of the maximum trend. The spectacular peaks in the 90’s have as background the simultaneously mounting phases of the Jupiter and Saturn waves, as well as that of Uranus. It is clear that the Dow Jones is still inflated because the exchange rates fluctuate far above the maximum trend (maintained by the central banks). This graph reveals that long-term investors, such as pension funds, would be more wise to invest elsewhere than on the stock market, since the Saturn wave will only begin to rise in 2025. Although some stock markets show a different trend, such as those of the Middle-East, which are sky-rocketing at the moment due to the dramatic increase in the price of oil, and that of Japan, for different reasons, the Dow Jones is relatively dominant, in reference to its extensive influence on the most important European Stock Markets. Due to the megalomanic fixation on maximum profit and bonuses for bankers and managers an end has come to ‘casino-capitalism’ and to the USA as financial superpower. The American budget deficit is now more than $ 11.000.000.000.000,- (= more than 11 billion dollars). A sum that is almost impossible to imagine. From Autumn 2007 the Saturn wave descended (loss of trust) and prices began to fall, as could have been expected. Unfortunately the pension funds remained blind to the trend, as incomprehensible as reprehensible. As in the Stock market crash of 1929, I anticipate the lowest point to be reached in 2010. By then the Dow Jones will have reached below the line of the maximum trend. 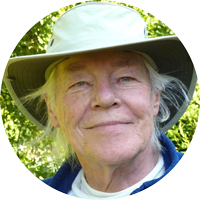 © Robert D. Doolaard, Amsterdam, October 2008.